A dog carriage, sometimes called a pet stroller, isn't just for the posh and pampered pooch. A dog carriage provides a safe, comfortable way for your elderly or injured dog to venture outside or travel to the veterinarian. 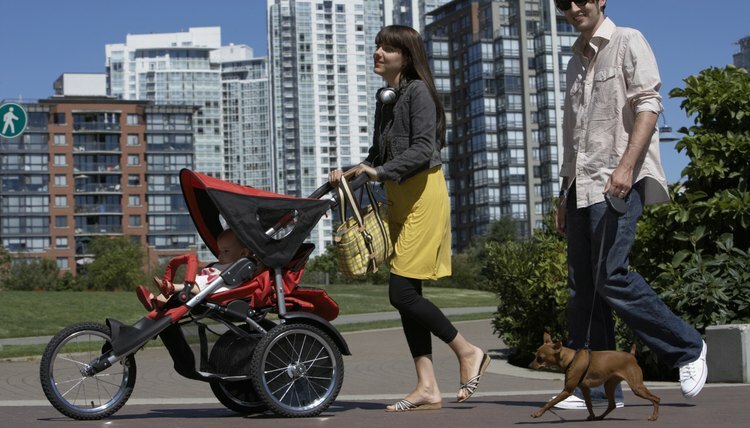 To save money, converting an old baby stroller into a pooch mobile makes practical and financial sense. Although a dog carriage and a baby stroller are similar in design, you must make a few essential adaptations before taking your dog for a stroll. Measure the perimeter of open space in the front of the stroller, such as leg openings. Go around the front safety bar with the measuring tape to accurately record the length and height. Cut mesh fabric according to the measurements you have taken. Add 6 inches on all sides to ensure enough material for stapling. Place one end of the mesh over the safety bar until it meets with the mesh on the other side. Staple the mesh into the cushioned underside of the safety bar every 2 inches. Pull the mesh taut and staple each end to its respective side of the stroller exterior. Space the staples 2 inches apart. Staple the bottom of the mesh to the carriage underside; securing this mesh barrier around the front of the carriage reduces your dog's risk of escaping or falling, however the area above remains open and accessible. Cut a second mesh square to fit over the open space between the stroller hood and the safety bar. Apply one side of a 12-inch hook-and-loop fastener strip to the edge of the mesh square. Apply the alternate hook-and-loop fastener strip along the outside of the safety bar. Staple the mesh square to the hood and pull it taunt over the safety bar so both hook-and-loop fastener strips connect. This will enclose your dog completely without limiting his air supply. Cut a leash 18 inches from the clasp. Staple the end without the clasp to the rear of the carriage. For your dog's safety, you must attach the leash clasp to his collar or harness whenever he rides in the stroller. Stroller models differ in design; adjust the amount and placement of your mesh as necessary to properly contain your dog. Avoid transporting your dog in a carriage unless his poor health or age makes walking difficult and uncomfortable.